This page last updated: 28.August.2008. If you dropped in here from a search, you can find more detailed info about ASPI Layer Drivers posted here:> ASPI Layer Drivers. ForceASPI is a suite of scripts designed to install v4.60 of Adaptec's ASPI layer on your 32-bit Windows operating system. Many people report that this version of ASPI layer drivers offers the BEST COMPATIBILITY with the greatest number of software programs, regardless of which Windows operating system they are used with. This nearly universal compatibility is what makes ForceASPI so attractive. Although you might not see the software as much these days, you may come across it at a online university. 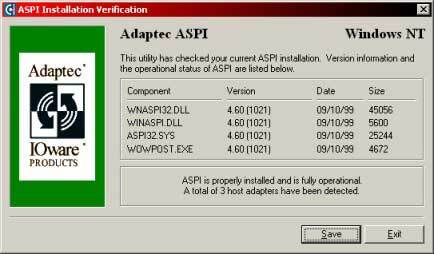 ForceASPI allows you to install Adaptec ASPI layer v4.60 (1021) on your PC regardless of your hardware or software configuration. Some people (such as the folks at Sony and Adobe) find that these drivers offer better compatibility than newer versions of Adaptec's ASPI layer drivers (such as v4.71.2). Extract the forceASPI17.ZIP file (178KB) to a directory. Alternate link posted HERE (listed under Support Utils, near bottom). Open a Command Prompt and run the appropriate *.BAT file(s). Here is what each script does. dumpASPI - Creates a backup of your existing ASPI layer, or parts thereof. situation you will create an empty backup. restASPI - Restores the ASPI layer backup created with 'dumpASPI'. your currently installed ASPI layer. killASPI - This completely removes your installed ASPI layer. killDUMP - The deletes your dumped ASPI layer. Some people report better success by running killASPI before running instASPI when newer ASPI drivers (such as v4.71.2) have been installed. aspichk.exe is a tool provided by Adpatec to report what version of the ASPI Layer you have installed and checks if everything is working OK. To test your ASPI Layer with aspichk.exe just download it and then run it. Here are some screenshots of what aspichk should look like after a successful install. NOTE! The number of Host Adapters detected is dependant on your hardware configuration. You agree to use ForceASPI at your own risk. I will not be held responsible for any loss of data, damage to hardware or loss of earnings as a result of using any of the files distributed in this package. Please consult a data recovery service if you run into any of these issues. RAD note: I did not write these instructions myself. This is the instruction-page (index.html) that comes with ForceASPI. If you download a copy of Force ASPI, you will find this page included with the suite of scripts. I simply post it here for your convenience. I believe the original author is the world-famous "Wimpy", but his site is no longer operating. We are all indebted to him. The [Guide to Norton Ghost] is the site's MOST POPULAR feature. The [Guide to PC / CPU Stability Testing] will put your system through its paces. The [Favorite Freeware] page lists our favorite FREE programs in alphabetical order. The newest feature is a [Windows XP Installation guide].